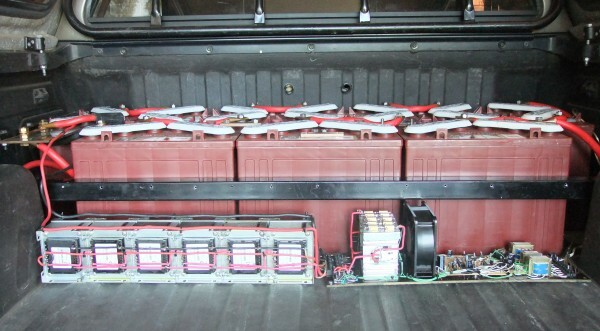 The Lead Acid Batteries can be charged in parallel or series connection. Both methods are described in this section. The parallel connection is described first and is used together with the Electro-Mechanical controller. 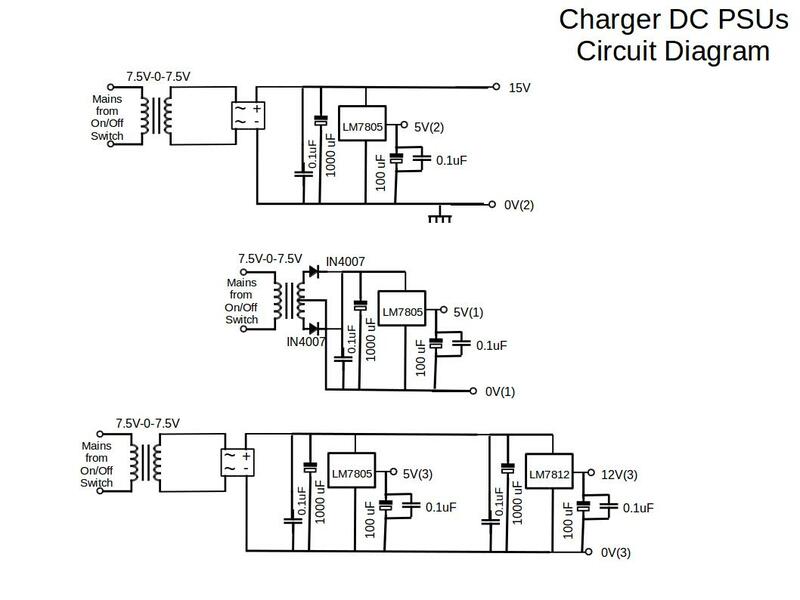 The second charger is used together with the Electronic PWM controller. 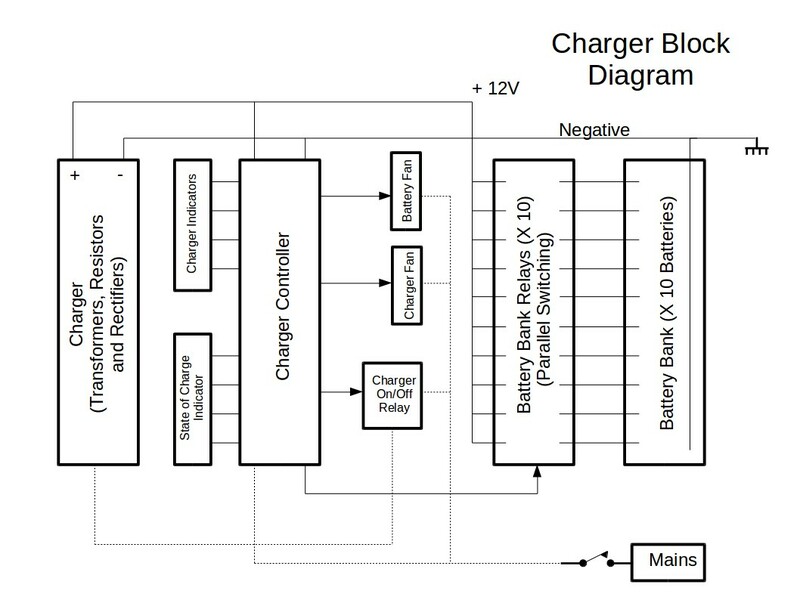 Thirdly a charger for a LFP battery is also described. 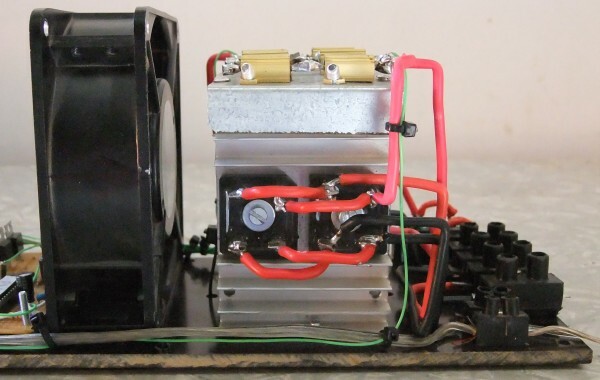 The Parallel Battery Charger used for this conversion is designed and developed for DIY purposes. It uses very simple techniques and is low cost. 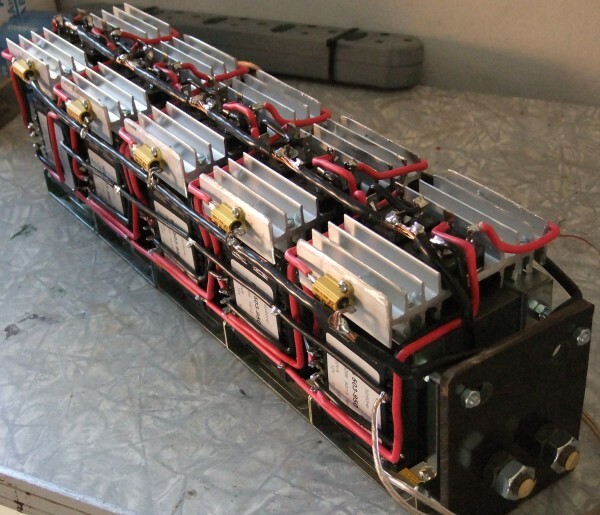 The Battery Bank Relays are used to switch the 10 Batteries in the Battery Bank in parallel. 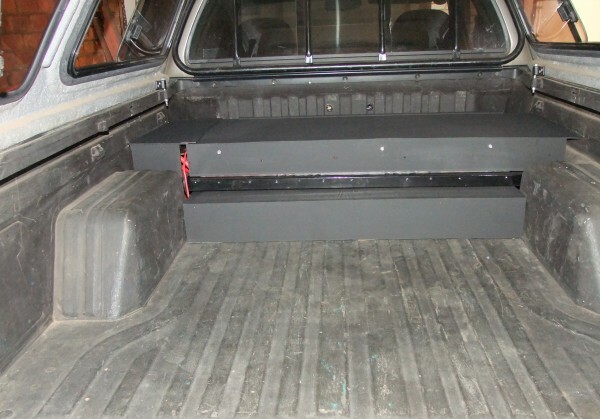 A 12V setup is obtained in this way. It is possible due to the fact that the EV Motor Controller switches all batteries off when in idle state, i.e. all batteries are then connected together with their negative poles and their positive poles are disconnected. 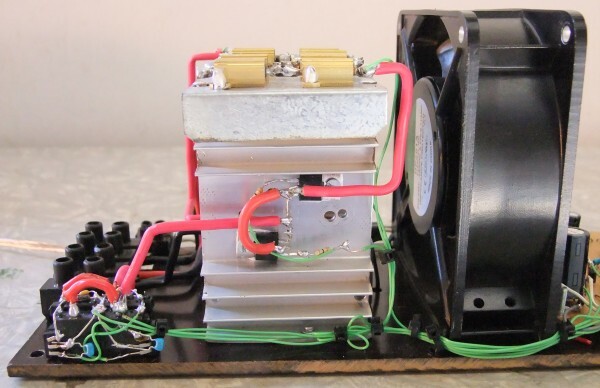 The Charger is built with 5 transformers of type RS 503-950, each equipped with a bridge rectifier and resistor. All components are available from http://za.rs-online.com/web/. 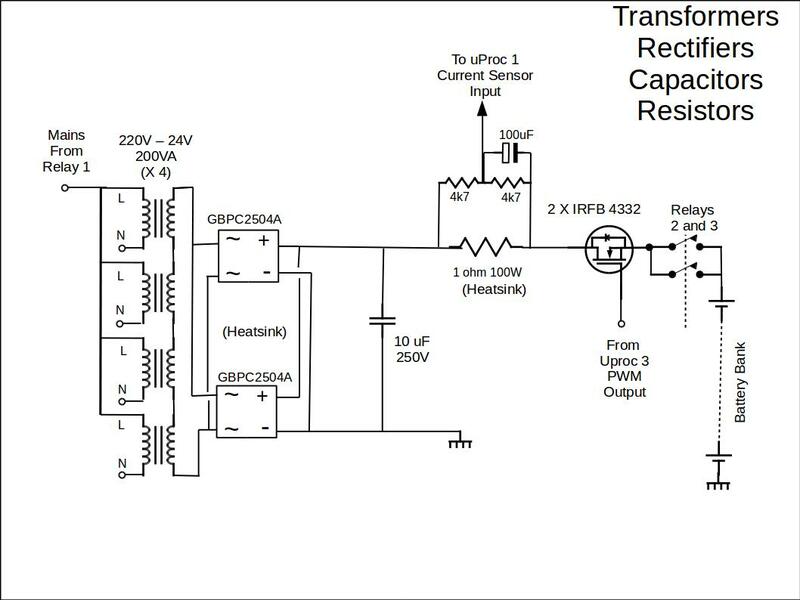 The resistor is a 0.1 ohm resistor and is used to protect the transformer from over current conditions. The charger can deliver 80A into a 12V battery setup. 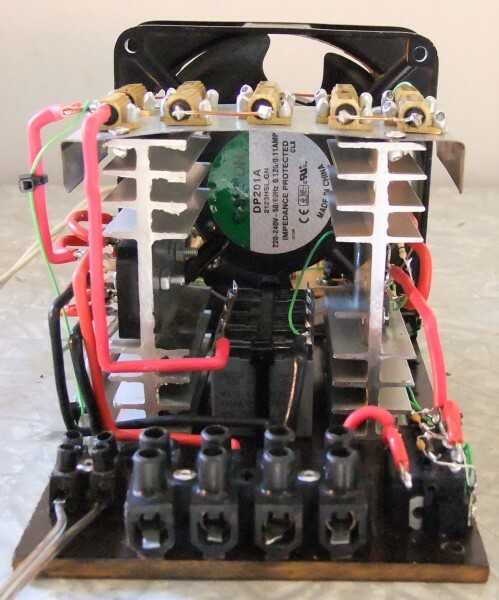 The transformers are 12V dual secondary transformers (not center taped). They are connected in parallel and in-phase. 1. Switch the Battery Relays on/off and thereby connecting the EV Battery Bank Batteries in parallel. 2. 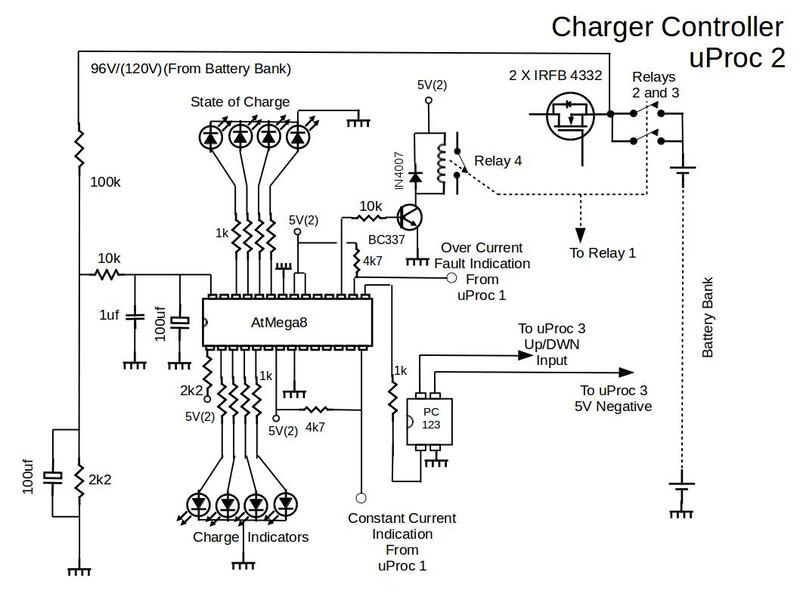 Measure the Battery Bank State of Charge and decide the period of charge. 4. 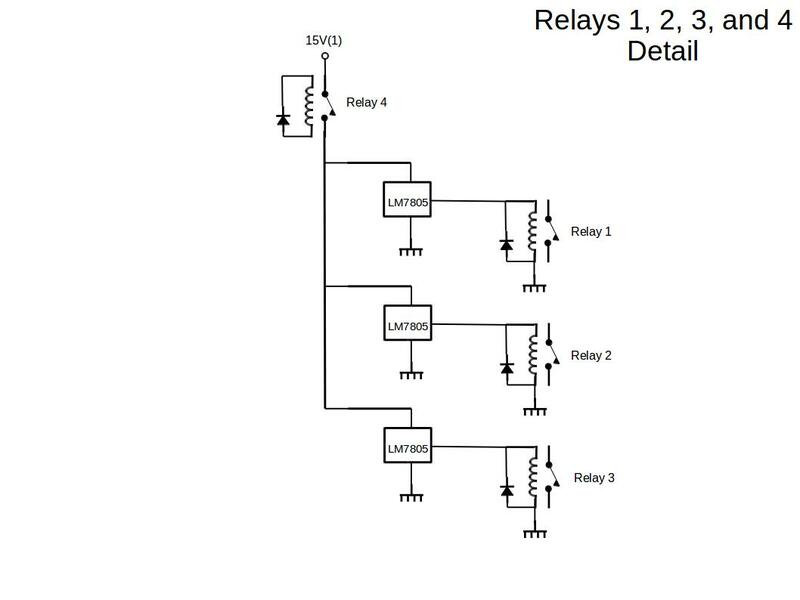 Control the Battery Charge Voltage on 14.3V by switching the Charger Relay on and off. 6. Indicates the Charge Process Stage with four LEDs. 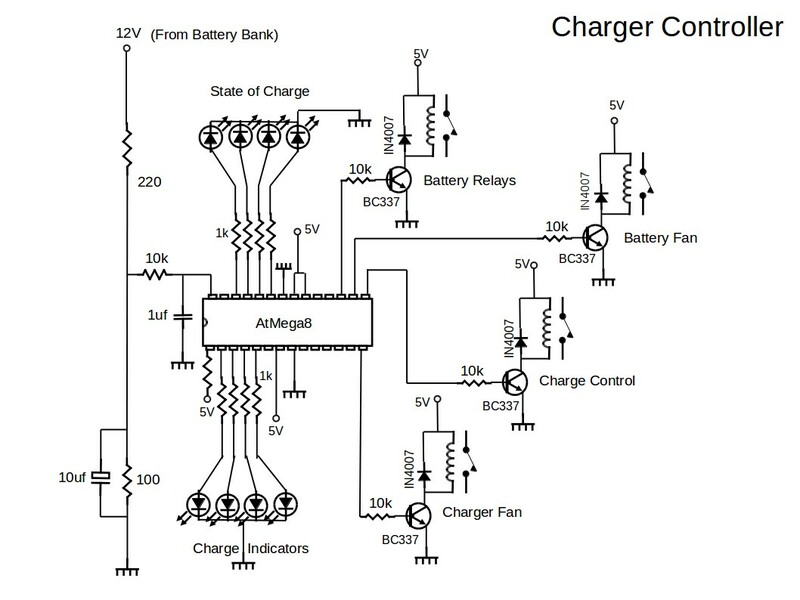 The Charge Controller is based on the ATmega8 processor. The program is written in Basic Language. The listing is given below. 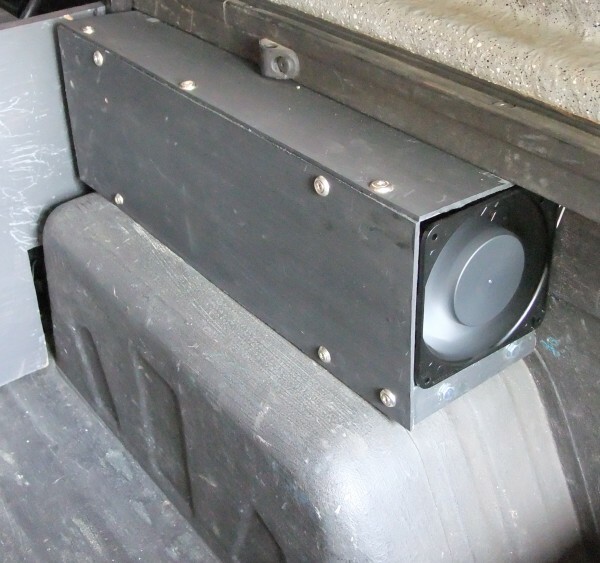 The Charger is installed in the back of the vehicle near the original petrol inlet flap. The Mains input is provided via an indicator pad installed behind the original petrol flap door. Mains input is taken from a standard household 15A 220V AC wall socket and is plugged into the charger by means of a standard kettle cord. The series battery charger is designed to be scaleable for different battery voltages, e.g. 72V, 96V, 120V, 144V etc. For clarity purposes, the following description will assume 96V as standard. The transformers are of the same type as those used for the parallel battery charger. (see above). the transformers are connected in series to provide a RMS voltage which is the same as the DC voltage of the battery bank. The difference between the peak voltage and the DC/RMS voltage is used to deliver current into the battery bank. The current is controlled using PWM techniques and a MOSFET switch. Processor 1 measures the current that flows into the battery. This processor can be set in SW to limit the current initially during a charge cycle to a constant current (e.g. 6A). 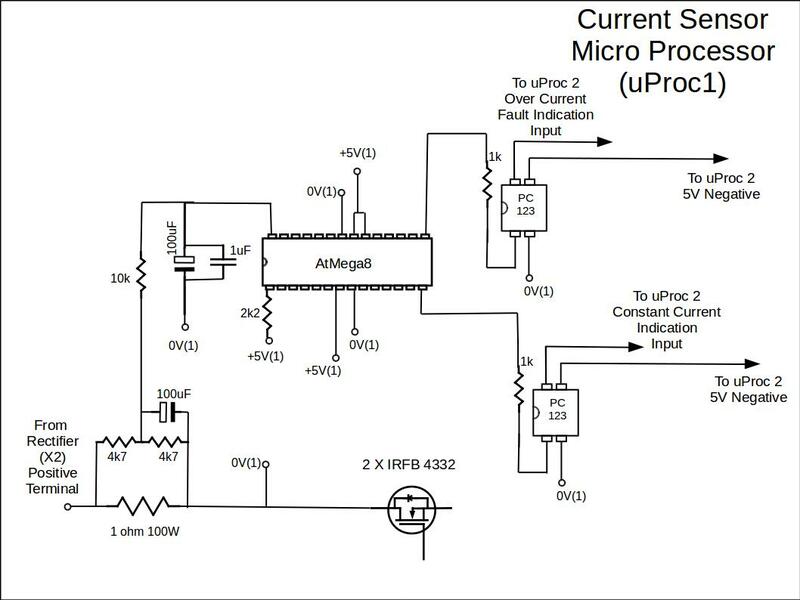 The processor indicates the above or below status to the charge controller processor 2. It can also indicate a fault status to processor 2 if the current is above a set limit (e.g. 7A). Processor 2 measures the battery voltage and will prevent over voltage during constant voltage charging. This processor indicates up/down status to the PWM processor 3. 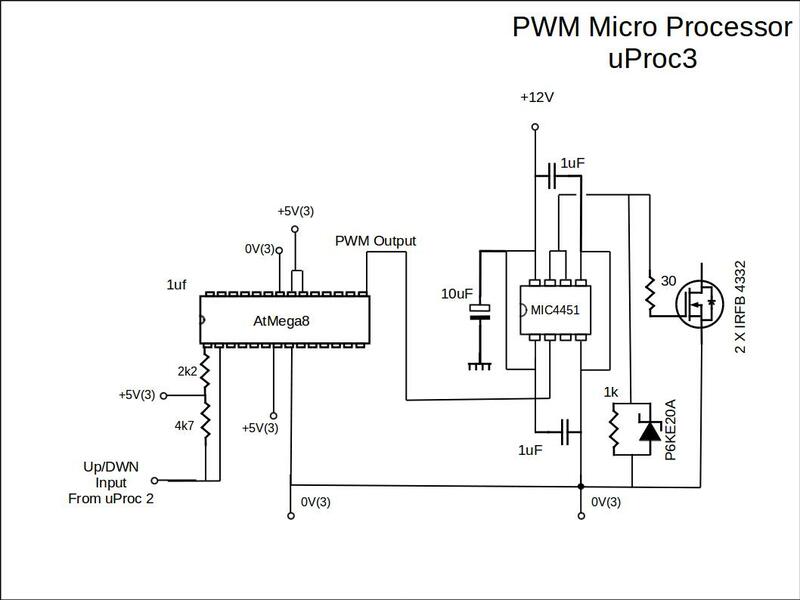 Processor 3 generates PWM switching pulses with which the MOSFETs are switched at a frequency of about 2.5kHz. As the up or down indication is applied to its input, the processor adjusts the PWM ratio proportionally to keep the current and voltages within specification for the batteries. In this way a closed loop is formed between the processors. 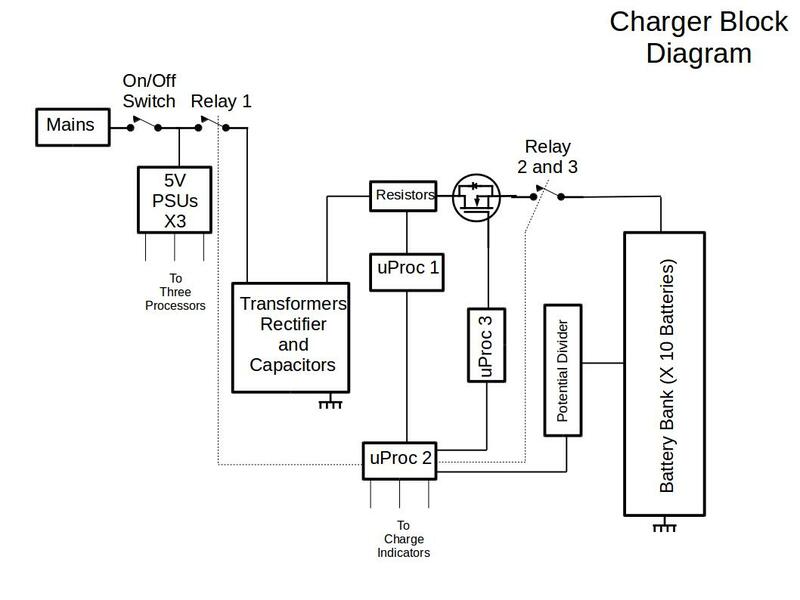 Processor 2 can stop the charge process immediately after a fault condition is sensed. (e.g. over voltage, under voltage, over current). It drives a set of indicators from which the charge process status can be viewed. The Charge Controller Processor 2 is based on the ATmega8 processor. The charger for the LFP battery is the same as described above for the Series Battery Charger. 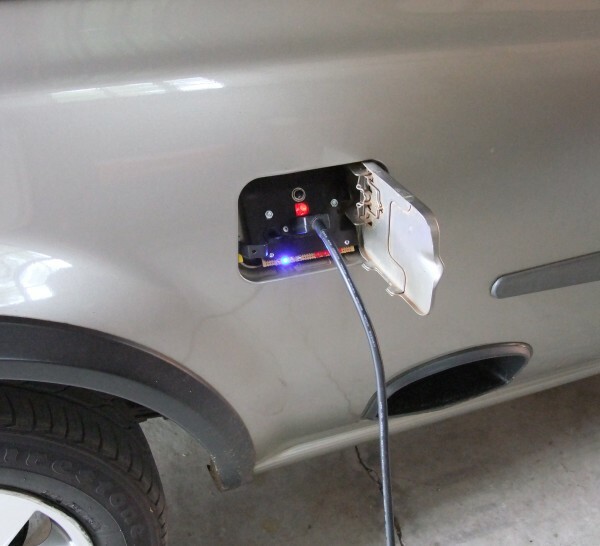 In the software, the voltage for the “constant voltage” charging point has been adjusted for the 140V as required by the LFP battery Pack and the “constant voltage” period has been shortened to 15 minutes. The “constant current” setting as been adjusted for 8A maximum in the software and the hardware has been modified with a 0.5 ohm shunt instead of a 1 ohm resistor. the shunt voltage (4V) is fed directly into processor 1.